In the finale of the American Le Mans Series at Laguna Seca (US state of California), Team Audi Sport North America has once again given impressive proof of the performance of Audi TDI Power. 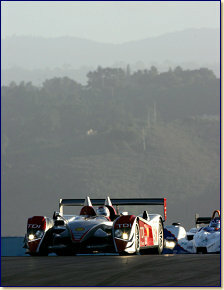 With the Diesel technology which is set to enter the US market for road cars in 2008, Dindo Capello (Italy) and Allan McNish (Scotland) were able to beat the best Porsche in a photo finish. Mike Rockenfeller (Germany) and Marco Werner (Germany) completed Audi�s triumph in the final race of the season with a third place finish. It was the 13th outright victory for the revolutionary Audi R10 TDI in its 21st race � on a track that favoured the LM P2 cars, lighter due to the regulations. In the 4-hour race, however, in the end the weight handicap of the LM P1 cars was not so decisive but the enormous torque of the 650-hp Audi V12 TDI engine. Despite the Audi drivers dropping behind the lighter LM P2 cars during the pit-stops, they were always able to re-pass them. In the last 30 minutes, the spectators once again witnessed a thriller: Dindo Capello had to defend the lead he had taken from the "factory� Porsche of Romain Dumas with Marco Werner defending his third place against the second Penske Porsche. Twice, Dumas was able to pass Capello in traffic but both times, the Audi driver hit back immediately. He crossed the finish line just 0.410 seconds in front of the Porsche. Marco Werner had a similarly slender gap, just 0.415-second ahead of the other "factory� Porsche. 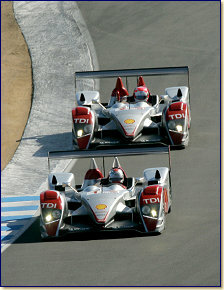 In the first half of the race, Allan McNish and Mike Rockenfeller had laid the foundations for Audi success. Starting from fifth position on the grid, it took McNish just 15 minutes to conquer the lead. Mike Rockenfeller also showed a strong performance on his first race with the Audi R10 TDI in the American Le Mans Seires, handing over the second R10 TDI in fourth position to Marco Werner. Werner dropped to ninth place following contact with Stefan Johansson�s Acura/Honda causing a nose change but was able to fight his way back to third position overall.